Aerial photography and videography has "taken off" with the abundance of new and affordable drones and quadcopters. Drone technology is rapidly advancing with powerful new models that include the 4th generation DJI™ Phantom series, the amazing DJI™ Mavic Pro, the Karma from GoPro® and a host of FPV racing drones and DIY and Ready-to-Fly kits. Whether you are interested in aerial imaging & drone videography or simply love FPV (first person view) flight, Lowepro has carrying solution that will protect your drone and get it on location. What drone do you fly? The size and form-factor of quadcopters are constantly evolving. For example the new Mavic Pro from DJI is very a powerful drone in a compact and collapsible package only slightly larger than a 70-200 mm lens. If you are media creator looking to include this powerful drone in your workflow, read our guide to the best camera bags for Mavic Pro. You will definitely want to check out backpack made for Mavic Pro such as DroneGuard BP 250, DroneGuard BP 200 as well as the DroneGuard CS 150, which is a super compact Mavic case. The DJI Phantom Series are without doubt the most popular imaging drones. If you have a Phantom (Series 1 through 4), your best fits are: DroneGuard Pro 450, DroneGuard BP 450, DroneGuard BP 400, DroneGuard CS 400 and DroneGuard Kit. Enthusiast drones like the Parrot Bebop 2 fit or the Yuneec Breeze fit well in the DroneGuard CS 300 or DroneGuard CS 200. Large Drones: The DJI Inspire (1 and 2) are larger professional imaging drones that cannot fit into a standard pack. For those who need to carry their Inspire on-location, Lowepro has created the DroneGuard Pro Inspire. 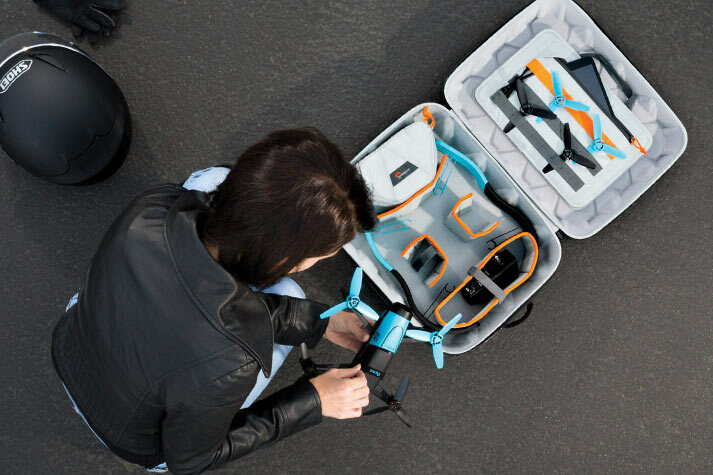 Small Drones: The new DJI Spark will fit in smaller bags and cases such as the DroneGuard CS 200 or ViewPoint BP 250 AW. FPV racers and transmitters are perfect in the QuadGuard Series, which was purpose built for racing drones and provides organization for all your parts in a compact carry and storage solution. Regardless of the size, make sure you have space to carry numerous spare batteries, rotors, tools and manuals while protecting delicate precision parts such as gimbal mounts, cameras, rotors, tablets/displays, antennae & transmitters. 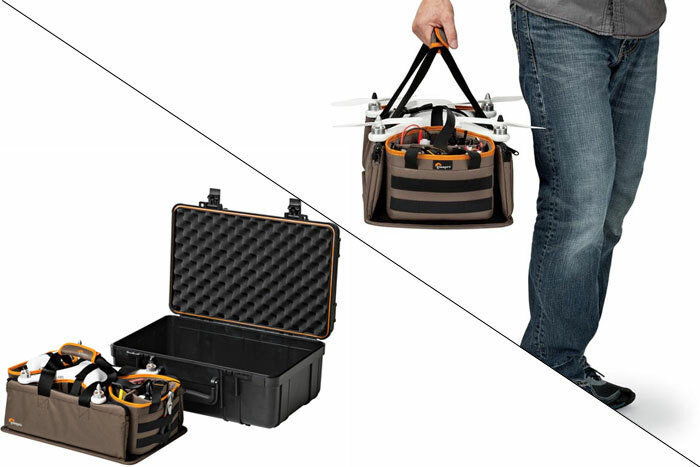 Which Bag Fits Your Drone? Where will you fly your drone? Getting epic shots with your quadcopter is all about location. Think about your primary flight location(s) and how you will get your drone kit to your takeoff area and back. If you only walk a short distance or drive right to your flight zone, a grab-and-go solution like the DroneGuard Kit might be the perfect for your needs. The DroneGuard BP 400 and DroneGuard Cases are a great light-weight semi-rigid case that can be carried over shoulder, handheld or like a backpack and also functions and a storage case for you drone and accessories. 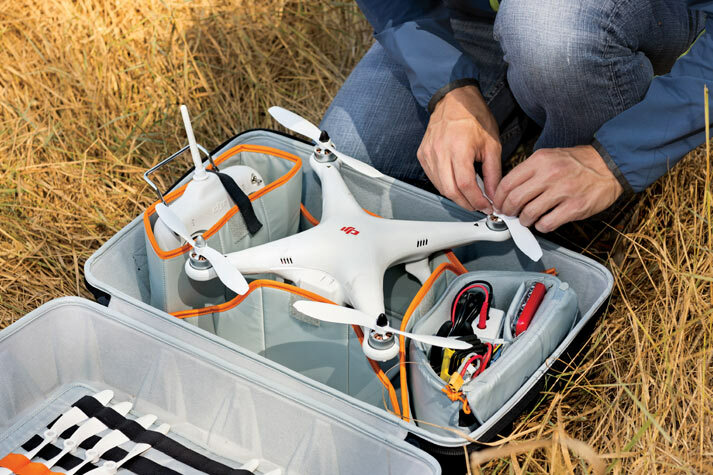 If you need to hike your DJI Phantom (or similar size quad) into your flight area, you will need a backpack that is light, protective and above all, comfortable to carry over terrain. 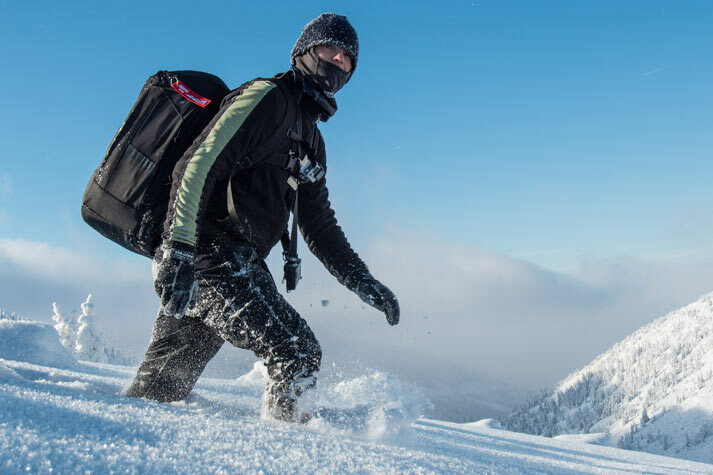 The DroneGuard Pro 450, DroneGuard BP 450 and DroneGuard Pro Inspired backpacks are the top-of-the-line in Lowepro's DroneGuard Series of Quadcopter packs. For hiking with a DJI Mavic Pro, consider the DroneGuard BP 250 or DroneGuard BP 200 or a range of camera bags that carry Mavic Pro and more! OEM cases often have laser-cut or pre-molded spaces that are limited to one configuration. Adding and organizing accessories such as a new transmitter, more batteries or your own set of tools may not be possible. Look for a system that you can customize and adapt whenever your needs require it. The DroneGuard divider system used in DroneGuard Backpack, Kit and Cases not only allows you to change as your kit grows, but can easily accommodate different shapes of quadcopters or different combinations of gear. Drones can be an expensive hobby. Since our bags are built to last, it is important they are adaptable to fit not only the gear you have right now, but also your next quadcopter... and the one after that. From custom-built "FPV 250" class racing drones to enthusiast quads with built in FPV camera systems, there is nothing quite like the thrill of putting yourself in the cockpit of a drone with a real-time video feed. 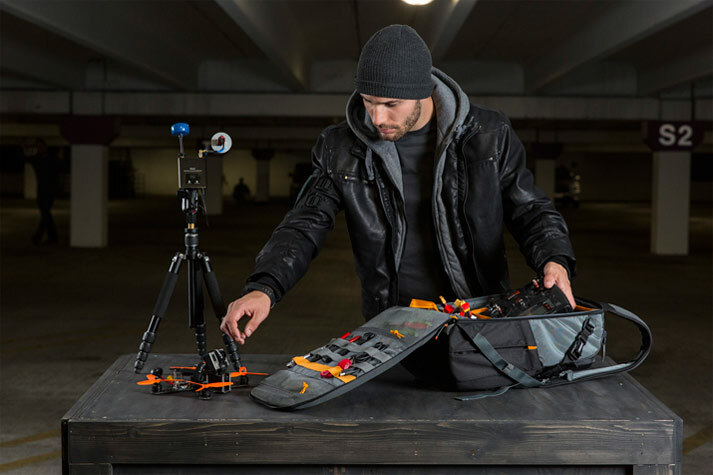 Lowepro designers LOVE to fly FPV/Racing drones so we built backpacks just for quad racers and their gear. FPV displays range from simple solutions like an iPhone or Tablet mounted to your transmitter to more advanced solutions like FPV goggles with antenna and receiver such as those made by FatShark. If you plan on exploring FPV drone action, make sure your carrying solution is flexible to accommodate all the new gear you will acquire. 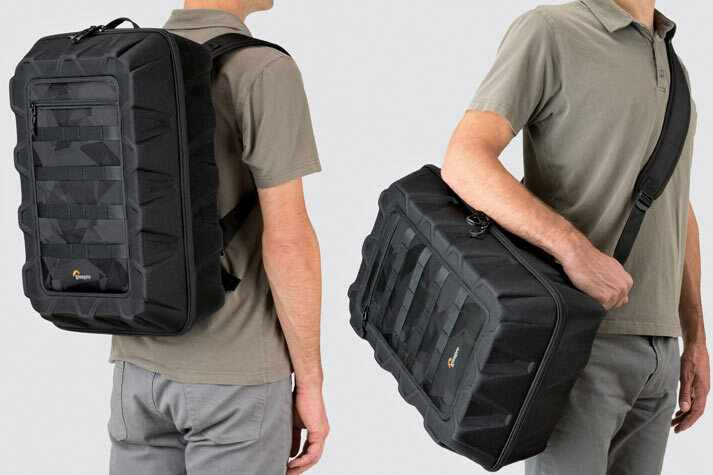 Lowepro's QuadGuard Series is the first range of bags and backpacks built just for FPV pilots BY FPV Pilots. When you break something on your drone (note this is a matter of WHEN, not IF), you can either pack it up for the day or repair it in the field and continue flying. Make field repairs easy by bringing the key tools and spare parts you are likely to need. In the field you can't always find a flat clear surface to calibrate and launch or repair your drone. DroneGuard cases makes a great workspace where you can fix your drone and keep small parts, nuts and screws from being lost. Drones are by nature very light; yet most OEM cases available are heavy and cumbersome while others are just repurposed camera cases that may not really work for drones. 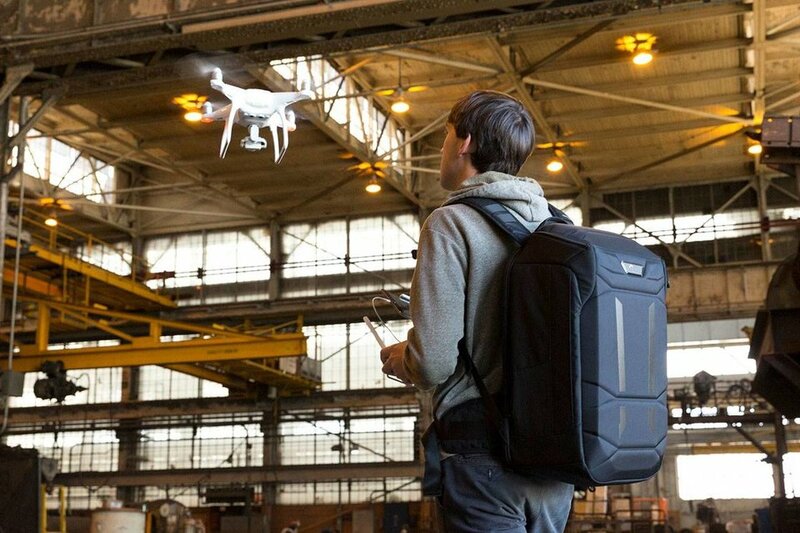 Lowepro drone backpacks are built from the ground up by actual drone enthusiasts. With just one look, those familiar with quadcopters will recognize the design features that make these kits so effective. From the easily customizable divider system to the flight tray and battery box, our systems are made specifically for the unique shapes of quadcopters and the needs of pilots. 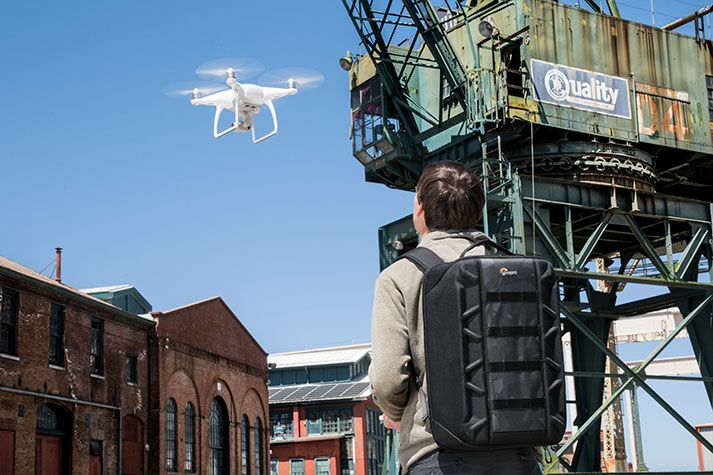 The DroneGuard Pro Backpack represents the pinnacle of customizable organization, carrying comfort and superior protection for DJI Phantom drones. We've taken all the lessons learned over 50 years protecting cameras and brought that knowledge and attention to detail in creating the best drone backpack on the market. Built by drone pilots for drone pilots, this pack is loaded with thoughtful design elements that will allow you to focus on your flight. Explore the features built into this pack and you will understand why DroneGuard Backpack is in a class of its own. One of the most powerful aerial imaging platforms for professional drone videographers is the DJI Inspire. These drones are large and unwieldy to carry outside of their heavy OEM Case. 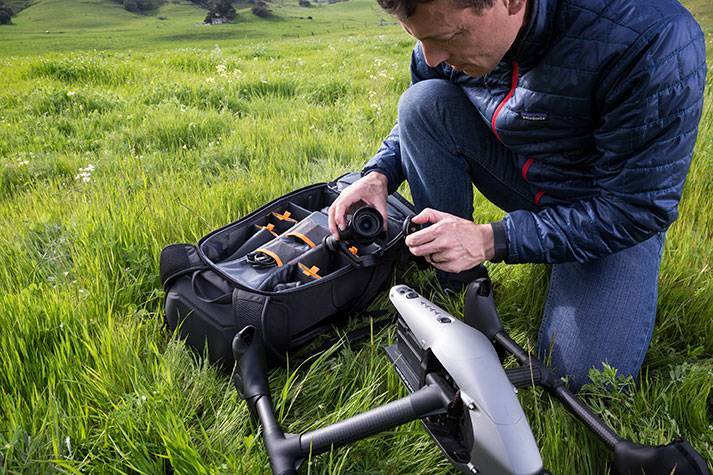 Take your DJI Inspire to your next shoot in the DroneGuard Pro Inspired Backpack. Designed to take your drone, up to 6 extra batteries, transmitter and all the tools and spares you will need to capture your shots. This pack is the next-generation of the popular DroneGuard CS 400. The same rigid Form-Shell™ construction is combined with an upgraded suspension, improved organization features and the ability to carry a 15 inch laptop plus 10 inch tablet. If you are looking for a lightweight but protective pack with lots of features for your DJI Phantom or similar sized drone, the new DroneGuard BP 400 may be your best choice. DroneGuard Cases are super-light weight and impact resistant. The FormShell™ exterior combines with the flexible carrying strap system to make this a superior all-in-one case for your quad. For the most popular imaging quadcopters such as the DJI Phantom Series and the GoPro Karma, the DroneGuard CS 400 is a great fit. The DroneGuard CS 300 and CS 200 were built with smaller enthusiast drones, such as Parrot Bebop Yuneeq Breeze, in mind. If you are into FPV 250 racing, using a full-sized transmitter, extra displays and lots of spare parts, we would recommend you step up in size to the DroneGuard CS 400. The Droneguard Kit is the ultimate grab-and-go system. The convenient carry handle makes the trip from car to take-off point quick and painless. 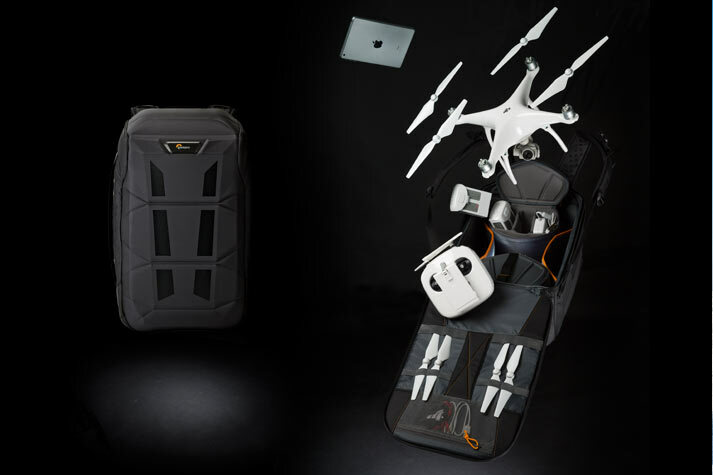 The Drone Guard Kit is much more than just a bag for your drones. It is a tool box, a maintenance platform, a spare parts bin, a remote control case, a battery bay and a flight pad. Think of the Drone Guard Kit as the aircraft carrier for your drone. But what if the epic shots you need require traveling to extreme locations? Combining the DroneGuard Kit with the Hardside 400 gives you the most extreme impact and waterproof protection for your drone. In the Hardside 400 Drone the photo insert has been replaced with the DroneGuard Kit making this case perfect for safely traveling with or shipping your quadcopter. Lowepro excels at building specialized packs for specific equipment and QuadGuard is a great example. QuadGuard was designed and tested by pilots who love to fly. We know that when racing FPV quads, a pilot must bring all the tools, spares, batteries, goggles and accesories with them or their flight time will be cut short. QuadGuard Series backpacks & cases allows the quad pilot to choose how they carry and configure their quad kit to match their ever changing gear.